The sanshin and trading ships are an integral part of Okinawa’s colorful history, with both set into the spotlight this weekend at the 34th annual Yomitan Festival. Sanshin music is at the heart of the Saturday and Sunday festival, with organizers paying special tribute not only to the instrument, but to the man who pretty much could be called the father of sanshin music. Some 400 Yomitan citizens will team up to play sanshin music and honor Akainuko, who was born in the west central Okinawa village. The performance, as with many festival music and dance presentations, is dedicated to hopes for a good harvest, and also for the health and well-being of the village and villagers. 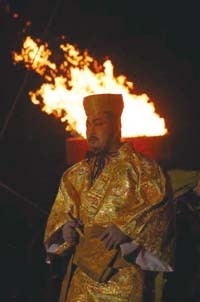 Entertainment includes historical recreations by Yomitan’s villagers, who will pay tribute to the Ryukyu Kingdom, which traded with China and provided the opportunity for Akainuko to become a trading pioneer. Taiki, as he was called, rode the ancient vessels to China and opened business links with Okinawa, bringing an exchange of Ryukyuan culture, customs and entertainment with China. Visitors to the Yomitan Festival will also be greeted and treated to the sweet potato, a delicacy villagers claim was made famous by their ancestors. Local pottery craftsmen will be plying their trade, demonstrating—and selling—a local specialty known as Kiroro.